Alemania – Feldheim – Comunidad con Independencia de Energía. Una comunidad se hace independiente mediante energía eólica, solar y biogás. Alemania - Freiburg - Eco-Ciudad - La ciudad implementa un enfoque multi-sectorial a la sustentabilidad. Alemania - Freiburg-Vauban - Eco-Barrio - La planificación urbana participativa crea un barrio eco-amigable. Austria - Vienna - Recolección de Bioresiduos - La recolección de composta a domicilio da un respiro al relleno sanitario y brinda fertilizante a agricultores locales. Austria - Wienerburg - Proyecto Greenbelt - Un tiradero se convierte en un agradable espacio verde. Bélgica - Hasselt - Ciudad de "Transportación Sensata" - Una ciudad Belga desarrolla alternativas integrales a la construcción de más caminos. Holanda - Groningen - "Ciudad Ciclista" - Una ciudad orientada al ciclismo revive la economía y mejora la calidad de vida de sus habitantes. Inglaterra - El Barro entre sus Dedos del Pie - El Proyecto Eden ofrece programas para reconectar a los niños con la naturaleza. Irlanda - Impuesto a las Bolsas de Plástico - Un ligero gravamen a las bolsas de plástico tiene un gran impacto sobre su consumo y mejora la apariencia de la campiña. Rusia - Lago Baikal - Impidiendo Polución con Uranio - Una ONG lucha para proteger al lago más antiguo y más profundo del mundo de un oleoducto y una planta de enriquecimiento de uranio. Suecia - Reforma Fiscal Ecológica - La reforma fiscal genera amplios incentivos para la sustentabilidad. Energiequelle GmbH and the 145 residents of Feldheim, Germany were determined to make the community completely energy independent—from fossil fuels and from the energy company that kept increasing prices. It took about 5 years and 2 million euros, but in April 2010 they finally achieved this goal with a mix of renewable resources—wind, biogas, and solar—and their own heat and electricity networks. In 1998, Energiequelle co-founder Michael Raschemann built his first four 85-meter wind turbines at Feldheim. Today there are 43, with an installed capacity of 74.1 megawatts (MW = million watts). They produce an average of 170 million kilowatt-hours (kWh) per year. Feldheim's biogas plant was completed by the local farmers cooperative in 2008. Its input is 3,500 m3 of pig and cow manure, plus 6,775 tons of corn silage and crop residues. 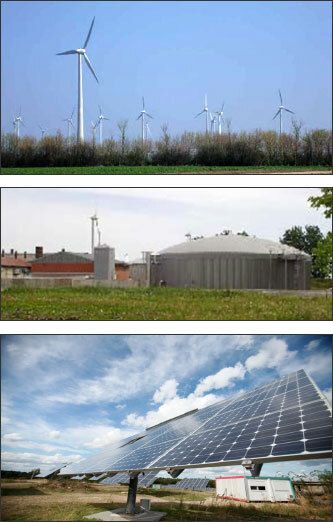 Its output is 11,250 m3 of fertilizer, 4 million kWh of electricity, and 4.3 million kWh of heat. At first, only the cooperative and a pig farm were using the heat, but since a heat network was completed in December 2009, the entire community benefits. 41 residences, the cooperative, 3 pig farms, and a factory are connected to the heat network. In times of extreme cold, a wood chip power plant springs into action to supplement the biogas. It is estimated this saves 160,000 liters of fuel oil every year. Electricity also flows from Energiequelle's 40-hectare Solarpark Selterhof. It was built on a former military training area donated by the municipality of Treuenbrietzen. The city removed trees, and Energiequelle cleaned up unexploded ordnance to make way for 96 photovoltaic arrays. Each has a motorized tracking device, which Energiequelle now manufactures itself in its new factory (EQ-SYS) in Feldheim, using energy from its wind turbines. The capacity is now 750 kW, and average annual output is 1.125 million kWh of electricity. During 2010 more solar arrays will be added, and the solar park will have a capacity of 2.25 MW, with a commensurate tripling of the output. According to Werner Frohwitter at Energiequelle, the community of Feldheim only uses about 250,000 kWh of electricity per year; the remainder is sold on the regional transmission grid. The final step was to build a new electric grid to become completely independent from energy giant Eon. In fact, the community formed its own energy company, a sort of consumer cooperative called Feldheim Energie GmbH & Co. KG, in 2008. Its partners include all of the community's landowners--43 households, plus 2 businesses, the farmers cooperative, the municipality of Treuenbrietzen, EQ-SYS, and Energiequelle. Each customer paid 3,000 euros (approx. $4,000) for a connection to the heat and electric networks; two households chose the electric only for 1,500 euros. In return they are guaranteed that the price of energy will not rise for 20 years. In fact, it may decrease noticeably in 12 years, when the debts are all repaid. That will be determined by the shareholders, each of whom has an equal vote. Currently the prices are 16.6 euro-cents per kWh for electricity (plus a flat service charge of 5.95 euros per month) and 7.5 euro-cents per kWh for heat (plus 29.95 euros per month). This is over 15% cheaper than what Eon charges, and the difference is expected to grow as conventional energy prices increase in the future. Feldheim has attracted visitors from other parts of Germany and other European countries, and even places as far away as Chile, Japan, and Thailand. Such village-scale, multi-resource systems are especially appropriate for countries with large rural populations not linked to an electric grid. Next on the agenda is creation of an "energy competence center" in the vacant restaurant building, to promote the research and educational value of Feldheim's energy independence. Called Germany's environmental capital, this 900-year-old city with a population of 205,000 is located in the southwest part of the country near the French and Swiss borders. 80% of the city was destroyed during World War II, but most of the houses were rebuilt in the original style. The Greens have a large stronghold here (some 25% of the population). Traffic planning: Reduction of dependence on cars without reducing the mobility of people or businesses. An affordable local transit system (trams and buses) has grown to include the surrounding regions, including its two adminstrative districts (Vauban being one of them) covering an area of 50 square kilometers. Infrastructure for cyclists has increased to 400 km of bike paths. A third of journeys are now done by bicycle. This has reduced air pollution. Energy/climate protection: There are regulations that new houses comply with low-energy housing standards (making use of passive solar energy through design of windows, positioning). The houses are 3% more expensive but energy costs are reduced by 30%, so money is saved in the longer term. For active solar energy, national subsidies and regional energy supply companies offer financial support. This is thought necessary to create an economy of scale that will result in price decreases. To keep this in perspective, solar energy only supplies 0.2% of its total consumption, yet Freiburg uses the most solar power in Germany. Co-generation also has been developed, including use of methane gas from the municipal waste disposal plant which provides electricity and heat for 10,000 people at 30% less emissions. Overall, Freiburg produces 50% of its own energy. Waste disposal: Waste is sorted into four types, one of which is organic (as with Vienna), collected in public "bio-bins." The results of this is that garbage was reduced from 140,000 tons in 1988 to 50,000 tons today (within the last few years). From 2005, residual waste must undergo thermal treatment in order to make organic components inert and reduce landfill gases and leachate, which will then go to a low-emissions incinerator. Urban planning/natural resources: A new zoning plan has declared 42% of Freiburg's extensive territory off limits to development (houses, suburbs, even roads). In some ways this resembles Curitiba, Brazil (see South America) in the municipal commitment to environment without the strong social flavor. But the tipping point is interesting in that the strong environmental awareness of citizens arose out of their uniting over the nuclear power plant, which helped create an engaged citizenry involved in decisions affecting them. Also, by making the connection between energy consumption and nuclear power, they went a step further and began looking for alternatives. For more information visit the Conference on Ecocity Development. Vauban is a residential district of Freiburg, where a participatory approach shaped its planning, and was based on a vision where ecological, social, economic and cultural needs would be integrated. Since the 1930s, Vauban had been a French army barrack. After the peace treaty in 1991, Freiburg city bought this 42-hectare area from the German government, and decided to make it a new residential area for 5,000 people to meet housing shortages in Freiburg. The plan was to provide good quality housing for young families, and to counteract suburbanization by recycling this site rather than eating into virgin land (it is thought that there is no need in Germany to do this anymore as there are enough disused industrial or military sites in its inner cities). The plan also included dense design, low-energy standards for housing, preservation of existing old trees and integrating them into the new designs and large amount of green spaces, public transportation and access (trams), and further infrastructure such as schools. From the beginning, the approach was participatory, and followed the principle of "planning that learns," which allowed for flexibility. More than 50 workshops were held, which included citizens, architects, a local non-governmental organization, engineers, financial experts and managers of co-building projects. Funding was provided through various institutes, the city of Freiburg, the state government, and the German government in the form of tax breaks for co-building builders. Technical resources were readily available as Freiburg has been committed to environmental sustainability since the 1970s. (Co-building, which has provided homes for 1,200 people, means a collection of housing units built together where members have input in the process and are designed for social interaction, i.e., with common spaces, meeting rooms, public gardens or kitchens, etc.) It was also made available to people of varying incomes. A car-free initiative was also launched, and owners of cars must park them in multi-story lots outside the periphery of the district. Some 40% do not own cars, and other alternatives such as car-sharing also exist. The housing met all low-energy standards, many of which use solar installations and a new design of vacuum toilets for use in a biogas plant. A co-generation plant uses wood chips and natural gas. With this extended participation, people became more active in the community in general and started their own initiatives including a magazine, festivals, and other community events. The valuable points about this case is that the ownership of the land by the city (and the variety of financial resources, tax breaks and technical resources, as well as the strong support of a non-governmental organization), allowed the city to take responsibility for the entire planning without becoming dependent on private developers. It highlights the unnecessity of clearing natural land for new development since many decaying industrial zones in Germany are available for "recycling." For more information visit the Forum Vauban. In 1988, Vienna was incinerating 62%, and dumping the other 38%, of its household wastes. The city had two incinerators and a landfill site, and officials were expecting increases in garbage without any plans to build new incinerators or landfills in the next few decades, so a few of the more responsible members of the city government began looking for alternatives. The city began to separate collection of paper, glass, metal, plastics, and finally "biowaste" (kitchen waste). Studies at a local institute had shown that composting had potential to save the city money, and the municipal parliament granted funds for the initial investment. The goal was to have a system that was cheap and user-friendly. It was understood that the system would not work without public support and commitment, so information leaflets about the collection service and backyard garden composting were printed in 11 languages and widely distributed, and an information service and phone line were set up to answer questions. The challenge was making high quality compost with low heavy metal content that could be used in gardens and organic farms. The composting plant went into operation in 1992, and the city set up collection sites called Biotonnes which were distributed in the streets so that each one would serve 65 inhabitants, and one Biotonne would theoretically be found within a distance of 35-40 meters from each residence. The contents were collected weekly on average. The annual diversion from the landfills is 90,000 tons, generating a savings of US$10,000,000 a year; this is more than 10% of Vienna's total waste collected. Farm estates have converted 230 hectares to organic farming, using 2,500 tons of compost. Some of the vegetables grown there are sold in local markets. Some of the compost is given to residents for their gardens. Using the compost has caused the number of earthworms to increase, and has helped reduce the amount of disease and pests in crops. The program has been presented at international congresses, which has attracted interest from politicians and technicians especially from Central/Eastern Europe. The system is self-sufficient, i.e., costs are covered by city taxes for waste collection. Benefits or services restored: Waste management, savings, fueled interest in organic farming, composting, and the environment, set the standard for the rest of Austria whose own municipalities are in varying stages of improving waste management, its close proximity to rapidly developing Eastern Europe (where there has been some interest) provides an alternate model to the Western throwaway society. For more information visit Best Practices. West Wienerburg, which is now a suburb of Vienna, had a history of brickworks. When the raw materials ran out, the area became a dump for waste and building debris. In 1978, the city of Vienna hosted a competition for ideas to create, among other things, a landscape plan for Wienerburg. The plan included various requirements for design appropriate to the natural conditions. The size was 60.2 hectares with several wooded areas interconnected to create a corridor. There are sports facilities, areas for recreation and picnics, woods, ponds, meadows, bicycle and walking paths. The park was designed to make optimum use of rainwater and so no artificial irrigation was required in creating the green space. This provides a model for future greenbelt creation which doesn't deplete groundwater. Residents and users participated in planning and creating the project along with the municipality, and therefore have a sense of involvement in the project. This means vandalism and pollution have been minimal. Local children and youth were involved with tree and greenery planting. One benefit is that local people are using cars less in favor of walking and bicycling. Bélgica - Hasselt - Ciudad de "Transportación Sensata"
All told, these regulations were a great success. Car use in the city was reduced, thus lowering the death rate, reducing both environmental pollution and traffic jams, and increasing the quality of life for residents and commuters. The transformation of the inner city ring road of Hasselt into a "Green Boulevard" that is two-way for buses, but one-way for other drivers has further reduced pollution, and has made public transport more visible. Due to higher visibility, free transit, increase in frequencies and number of lines (in 1996, there were only 3 bus routes with about 18,000 service hours/year, now there are 11 routes with more than 95,000 service hours/year), the use of public transport has risen dramatically, with ridership increasing tenfold. In addition, half of the respondents in a survey affirmed that, since the buses are free, they have been coming to the city center to shop more often, thus making positive contributions to Hasselt's economy. The transit system in Hasselt cost taxpayers approximately $1.9 million in 2006, amounting to 1% of their municipal budget and making up about 26% of the total operating cost of the transit system. The Flemish national government covered the rest (approximately $5.4 million) under a long-term agreement. For comparison, according to Dave Olsen, a bicycle and public transit consultant, researcher, and advocate based in Vancouver, Canada, 1% of the City of Vancouver's municipal budget for 2007 was about $8.5 million. Finally, seeing that bikes are the most sustainable form of transport, Hasselt policy makers implemented a system in which one can borrow a bicycle, tandem, scooter or wheelchair bike free of charge. Clearly, Hasselt sets a great example of sensible and sustainable transportation for other cities around the globe. Holanda - Groningen - "Ciudad Ciclista"
Banning parking in the central market square. Access priority was given to public transportation. Through traffic in the city center was discouraged and all downtown through lanes were blocked. Traffic circulation was also changed so that one-way streets made it easy to get out of downtown but hard to enter. Parking garages were built within walking distance from the city center. The aim of this was to force cars to take longer detours at the same time as providing improved infrastructure for bicycles. So in addition to the regulatory measures, infrastructure was also developed to allow people to absorb the new policies into their lifestyles. In other words, making it "cheap and easy" to adopt an environment-friendly lifestyle. New city center buildings must provide cycle garages, there are thousands of parking spaces or street racks for bicycles, and under city hall a bomb shelter was recycled into a bike park. Initially, there was revolt over the regulations by store owners, who feared the economy would suffer. But in fact the opposite has happened. After these changes were underway, outmigration (to larger urban centers) slowed down and reversed, rents are now the highest in the Netherlands, and businesses who are not included in car-free zones want the program expanded, and are requesting bans on cars where their stores are located. Gerrit Van Werven, who helped to develop the policy, says, "This is not an environmental program. This is an economic program. We are boosting jobs and business. In this city it has been proved that planning for the bicycle is cheaper than planning for the car." Another important spinoff has come in the dynamic of traffic. Such a large number of cyclists has slowed down traffic and changed the attitudes of car drivers who have less power in reduced numbers. This has improved road safety. The program costs about US$40 million per year, but a study suggests that each car which the policy keeps off the road saves US$350 million in "invisible" costs such as pollution, parking, health, infrastructure, and quality of life. Groningen has set an example for the rest of the country, where, by the end of the 1980s, all Dutch cities with over 50,000 residents had some form of pedestrian areas off-limits to cars. For more information visit the Global Ideas Bank. Children are spending less and less time outside. Not only are they missing out on a whole world of fun, adventure and really cool games, but there are some serious knockon effects including health problems, poor social development and little understanding or interest in the environment. That's why the Eden Project has launched a program to combat the increasing alienation of children from their environment. We call it Mud Between Your Toes because its aim is to reconnect children with the outside world - and that involves learning to love the mud. Eden is a place of beauty and wonder which explores humankind's dependence on natural resources. You will find crops, landscapes and wild plants which reflect the amazing diversity of our planet. There's also internationally famous architecture and art which draw inspiration from nature; and a stage on which people working to make our world a better place can tell their stories. Ten years ago this place was a barren, exhausted china clay pit. Now its massive Biomes (one of which is the biggest greenhouse in the world) and millions of plants bear witness to what can be achieved by a can-do attitude and the tenacity of the human spirit. Eden is as potent a symbol of hope for the future as one could find anywhere on earth. Simple pleasures await you here too: imaginative children's play areas, impromptu storytelling, workshops for all ages, a wide choice of delicious food, a shop full of amazing stuff from all over the world - and just sniffing the flowers, of course. Before March 2002, Ireland's 3.9 million people were using 1.2 billion plastic bags per year. These bags were generally non-recyclable, took 20 to 1,000 years to break down in the environment, were littering the countryside and clogging storm drains, as well as adding to the burden on the country's landfill sites. Worldwide some 100,000 birds, whales, seals and turtles are killed by suffocating on plastic bags. Ireland's mostly rural population's waste disposal system is poor, making it an ideal place for this kind of initiative. The idea of the "plastax" or tax on plastic bags was first floated in 1999 and finally in March 2002 the Environment Minister launched the program, one of the first of its kind in the world. For every bag used at the checkout counter of the supermarket a 9p (about 15 cents) surcharge was added. The revenue raised from this would be put into a fund for environmental projects such as recycling of refrigerators and other large appliances. But the Environment Minstry's goal was less about raising money than changing consumer behavior. Before imposing the surcharge, the government launched a TV advertising and billboard campaign to promote and explain the program to consumers. The program has been greatly successful. While there was some initial minority opposition to the program, generally it has recieved popular support from large supermarket chains and consumers, who have quickly adjusted lifestyles by bringing reusable bags to the supermarket. The results have been immediate. Within the first three months of the program use of bags went down 90%, and raised $3.45 million for the Irish State coffers. There has been a noticeable improvement in the environment as a result. The program has also attracted attention of the UK and US, especially the former which is considering adopting a similar program. For more information visit Clean North. Lake Baikal in Siberia is one of the most important bodies of fresh water in the world. However, Russia's increasingly authoritarian government and rapidly growing oil and nuclear economy threaten the health of this cherished natural resource. Lake Baikal native Marina Rikhvanova, a long-time figure in Russia's environmental movement, leads efforts to protect the region from potential environmental disaster brought on by industry. After successfully campaigning to reroute a destructive petroleum pipeline from the lake's watershed, Rikhvanova is now working to prevent the construction of a uranium enrichment facility in the region. Lake Baikal, the world's oldest and deepest lake, is known as the "Galapagos of Russia." It holds 20 percent of the world's unfrozen freshwater reserve. Its age and isolation have created one of the world's richest and most unusual collections of freshwater flora and fauna, including 1,700 endemic plant and animal species. Located in southeast Siberia, Lake Baikal provides a way of life for the local communities and is cherished by wilderness lovers from around the world. In 1996, it was declared an UNESCO World Heritage Site. In 2002, the Russian government announced plans to build the longest petroleum pipeline in the world, extending 2,566 miles from eastern Siberia to an oil terminal on Russia's Pacific coast through Lake Baikal basin. In 2005 Transneft, Russia's state-owned oil company, decide to build the pipeline within a half-mile of Lake Baikal, despite concerns about possible oil spills and leakage. Rikhvanova, co-chair and co-founder of Baikal Environmental Wave (the Wave) immediately opposed the plan, and embarked on a four-year struggle to protect the lake. Working within Russia's increasingly repressive climate, she successfully led a national campaign that included rallying thousands in protest. Volunteers of the Wave and Baikal movement also obtained over 20,000 signatures and partnered with international organizations during the campaign. Due to these efforts, in April 2006, President Vladimir Putin ordered the pipeline to be rerouted away from the lake's watershed. This marked a tremendous success for civil society and the environmental movement in Russia. Despite the civic outcry to protect the region, threats continue to plague Lake Baikal. In late 2006, the Russian government announced plans to construct the International Uranium Enrichment Center near Angarsk on the grounds of an existing nuclear facility located just 50 miles from Lake Baikal. The purpose of the center is to enrich uranium transported from other countries and then return it to them for reuse. Once the uranium is enriched, only 10 percent of the radioactive material will be returned to the customer, leaving 90 percent behind for storage. Russia is the only country in the world willing to take radioactive materials from other countries for processing, long-term storage, and burial. Countries that do not currently have nuclear infrastructure are willing to pay a premium to Russia to do this dangerous work. This budding industry poses significant environmental and health risks. Uranium tailings, leftover waste in the form of sand after enrichment, consist of extremely harmful radioactive and toxic uranium hexafluoride. These tailings are preserved outside in sealed containers. Should these containers be compromised as a result of a fire or otherwise, uranium hexafluoride would leak into the air and form fluoric acid. If the radioactive sand is left on the ground and allowed to dry, wind can deposit it on vegetation, allowing radioactive materials to enter the food chain. It can also wash into rivers and lakes, contaminating them. Rikhvanova and the Wave now lead the effort to stop construction of this uranium enrichment center. They are demanding that the required independent environmental impact assessment and review be carried out. In early 2007, she traveled to Moscow to protest the building of 40 new nuclear power plants across Russia and in the spring of 2007, she organized several protests in Irkutsk, the latest on April 14 which was attended by more than 1,000 people. Rikhvanova has also met with officials from the Russian Atomic Energy Agency who agreed that if the local population was against the center, it would not be built. Despite the promise, plans for its construction continue. In late July, Rikhvanova hosted a No-Nukes Camp in Angarsk, one of many citizen training camps held during the summer in the region. Camp participants attended trainings about how radioactive waste is imported into Russia, the danger of transporting nuclear materials and the lack of information available to the public about plans for further nuclear development, with a focus on what civil society groups can do to help stop the project. A recent challenge to Rikhvanova's work is the controversy around her son, Pavel, and his alleged involvement in a murder that occurred at a protest camp run by radical political groups held in the summer of 2007. This camp was attacked by nationalist thugs (according to the government report), resulting in injuries and one death. Rikhvanova's son, Pavel, was in the area when the murder happened, though he has denied involvement in the violence. Following his arrest, authorities seized Rikhvanova's home computer. The local newsmedia reported on the arrest story, attempting to connect Pavel's alleged role in the attacks to Rikhvanova's efforts to protect Lake Baikal. Rikhvanova must now struggle both to clear her own name and support her son while he continues to be held without charge in police custody. Marina Rikhvanova is a recipient of the Goldman Environmental Prize. For more information, see the Goldman Prize website. Compared with the rest of the world, European countries have very well-developed "green" fiscal policies. While most of the these are applied to transportation (motor vehicles, gas and diesel), "green taxes" are used to address various other issues such as waste management, packaging, air emissions, fertilizer use, and extend to other market-based incentives such as trading "credits," take-back programs for manufactured goods, deposit-refund schemes, rebates, the removal of perverse subsidies (and introduction of others) and various other programs. While many of these measures were originally used to target certain environmental issues, there has been a trend towards more comprehensive tax reform to shape environmentally responsible practices across the board. Scandinavia, the Netherlands, Western European countries and Japan have set up commissions to explore the opportunities for and issues surrounding introducing broader green tax shifts. In the three decades up to the Rio Earth Summit in 1992, there was growing awareness in Sweden of carbon dioxide emissions and global warming, and the signing of the Rio Declaration pushed them towards more clear commitments. The government had been trying to find the best way to reduce all types of emissions, but the economy had slowed down. Their dilemma was how to do this and still raise employment and also survive in a transforming global system that put increasing pressure on national industries to become more "efficient" by externalizing costs. Knowing that environmental regulation was unpopular, especially among industry, the government decided to introduce several taxes in 1991. One of these was the carbon tax, levied on a two-tiered basis for two classes of users, household and industrial. They were able to introduce them to households (who depended on this mainly for home heating and transport) because there was broad popular support. Introducing these taxes began to have an effect on heating infrastructure, where the use of biomass increased in local heating districts. It also created new demand for biomass and led to innovations in the field, as well as improvements in other technologies in home heating efficiency. For industry, who were opposed to the taxes, there were initial exemptions and incremental expansion of taxes. Sweden was among the first countries to initiate the "feebate" system, which was a way to get support from business. The revenue collected from these various taxes was returned to any businesses who increased efficiency of their plants, proportionate to the increase; in other words, the bigger the improvement, the bigger the refund. This would help businesses offset the costs of investing in improved efficiency. Under this feebate system, NOx emissions fell by 35% in the first year alone, and investment in abatement technologies went up accordingly. (This is a situation where heavier polluters are transferring resources to, or subsidizing, lighter polluters - -instead of the case where government and public typically subsidize heavy polluters with elevated health care costs and reduced quality of life). The taxes have influenced emissions even more dramatically on carbon and sulfur than on nitrogen. The tax on sulfur led to a reduction in sulfur content on fuels 50% below the legal requirement and halved SO2 emissions in the last eight years. The total decrease in emissions since 1970 has been over 70%, and Sweden has led the 30% club, in a pledge to reduce SO2 emissions by 1993-95, and other countries such as France, Canada, Norway, Denmark, the Netherlands and West Germany followed suit, pledging reductions of 40-50% by the mid-nineties. The effects of these changes are apparent on ordinary lifestyles. Emissions controls are used on cars, appliances are energy efficient, homes are energy conserving, and household and industrial materials are recycled. One of the cleanest garbage-to-fuel plants in Karlstad separates and recycles most of its input and burns the rest for energy. Co-generated steam from the plant provides hot water and heating for 60,000 of the area's residents, and an adjoining landfill feeds a biogas system for additional energy. There is a "solar" village above 58 degrees latitude where households have managed to meet their heat and hot water needs by solar alone for five months of the year, which shows the potential for northern regions to take advantage of the longer days of summer. Taxes on nuclear energy have also been part of a plan to phase out nuclear power by 2010, while retaining limits on hydroelectric power. Over the years these programs have evolved and extended to nitrogen fertilizers, pesticides, scrapping cars, gravel extraction and others. One speculation is that the expansion of the EU might give northern and western Europe the incentive to externalize some of their costs onto Eastern Europe - -and this is already happening in Slovenia, which is said to be on its way to being the new "Detroit" of Europe, where heavy industries are taking advantage of the removal of barriers and lower costs to set up plants there. At the same time, there might also be changes in terms of technology transfer and harmonization of technologies across the region as well, which may allow Eastern Europe to leapfrog some of the more backward stages in development taken by the West. It is possible to imagine both trends happening simultaneously. This case, or a similar one, might be useful in looking at larger-scale, global tipping points where an economic system is fundamentally redesigned in a way to internalize costs and cause far-reaching effects on the infrastructure of production, distribution, marketing, consumption, lifestyle, transportation, energy, land use, waste, employment, social services, etc. While taxes in the US are a dirty word, and any talk of fiscal restructuring puts most people to sleep, there could be many concrete examples of the spin-off effects to bring this case alive to ordinary readers. While the Irish "plastax" (preceeding) is an interesting case in that it shows how targeting a specific problem can bring quick results, a case like this would show a slower, more fundamental process which results in a deeper economic and social transformation. In effect, it's a vision of full-cost accounting, and much of Northern and Western Europe have managed to incrementally introduce these changes with strong support from not only the public, but also industry - -if introduced with careful consideration for incentives and the clear understanding of potential for savings. And of course, Scandinavia or western Europe, while leagues ahead of the rest of the world, are still far from achieving what will be an ongoing drawn-out process which each region will have to follow their lead while adapting to regional conditions.